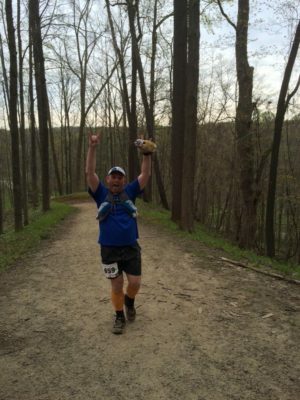 The CLE trail race is a cool race in North Chagrin Reservation just outside of the city of Cleveland Ohio and consists of three distances – a half marathon, a full marathon and a 50k. I found this race when through a quick search of races near Ann Arbor, Michigan where I was at the week before the race for work. The 2016 edition was the third year of the race and there was very little information on the race besides the ultrasignup page and a facebook group. Nonetheless I thought it would be a great opportunity to run the 50k and see how my legs were recovering from the Orcas 100 in February. The race was held on May 7, 2016 and the weather was pleasant for the locals – in the 70s and sunny, but for me coming from Alaska the weather was very challenging. The course for the 50k consisted of two 13.1 mile loops and a short 5ish mile small loop for the final distance. The course is very pleasant with wide trails under a hardwood canopy for the majority of the race. Mostly the trail was hard packed with a few rocky and rooty sections and some mud holes, but overall the trail was non-technical and very runnable. Based on the data from my Suunto Ambit 2 there was 2500 feet of gain and loss over the 50k course. The race offered good swag – a tech shirt and a cool medal as well as nice goodies in the runner bag and door prizes for the finishers. As I mentioned this was my first race since the Orcas 100 and I didn’t really do any significant training for the race, but took it as an opportunity to test out my legs and just enjoy doing a race in a new place. Running is like riding a bike and my legs had come back over the weeks leading up to the race and my longest training run was only 9 miles, but I was able to put in a couple 50 mile weeks leading up to the race so I figured I would at least be able to finish. I had my standard kit for the race – Altra Lone Peak 2.5’s, my Ultimate Direction handheld and Jurek 2.0 vest, Injinji socks, nike dri fit shorts and pro combat compression shorts, lightweight tech t-shirt and my trailwhipass visor. My gear kit worked fine, the Altra’s and Injinji’s did great on the hardpacked non-technical course and I had no blisters. The vest was a bit overkill, but I wanted to be able to access my nutrition instead of relying on the course supplied aid. This was a good move as the warm temperatures really played havoc on my digestive system. I have my nutrition dialed in or at least I thought I did. The heat really played havoc on me, it was my first race in any significant heat in a long time. I took all my normal nutrition – Gu gels, Honey Stinger blocks, Justin Nut Butters and CarboPro. Early in the race I was able to take gels and the Honey Stinger blocks in addition to the CarboPro in my hand held but as the race wore on my stomach didn’t want to process the gels and when I tried to take a nut butter at the beginning of the second lap I almost lost my lunch. From that point on I could only take CarboPro – which was great because at least I was getting calories, but anything else brought nausea. I also dealt with cramping for the first time in a long time and of course I had not brought any S Caps with me. The course had four aid stations which were well stocked with water and electrolyte drinks but hit or miss with food other than gels and only one of the aid stations had S Caps. I did eventually find that aid station and stocked up and that knocked out the cramping. I won’t be forgetting S Caps anytime in the future. Overall the race went very well, I went out fairly conservative and was looking to try and finish in 6 hours. I was ahead of pace for the first lap and on pace when I rolled through the second lap completing the marathon distance. I felt good, but my stomach had other ideas which required me to spend some time in the outhouse. Eventually I rallied on the last short lap and finished in 6 hours and 23 minutes. The hills on the course are short and runnable, but considering I had not trained for hills I walked them, and then ran the downs and flats which is my normal race strategy. I appreciated the aid station workers on Heckler Hill they provided great entertainment though I think they could up their heckling game and told them so on every lap! This is a great race in Ohio and Eddie and Suzanne Carrigg have put together a solid race series and are expanding it this fall with a 100k called Conquer the Castle trail race in the fall. I would definitely run this race again if I find myself in Ohio.